Tuck your media collection in, display your television and sit back and enjoy the beauty of the Amish Cable Mill Cantilever Open Top Flat Screen Entertainment Center with Drawers. Solid wood shows its beauty as well as delivers a quality product that won't wear out or break down. Everyone will be looking at it at some point. 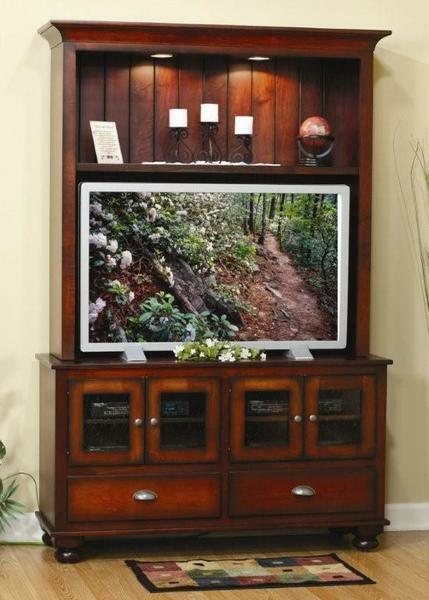 Family, friends and neighbors that come by are sure to comment on this Amish made entertainment center. Gorgeous curves contribute to the moldings, while the unit offers an open top shelf, TV space, 4 lower cabinet doors and two spacious drawers. Rounded bun feet add to the warm design. The Cable Mill is shown here with a coffee brown finish that's burnished. Burnishing is a distressing option that leaves the outer edges of the furniture a dark color and the body of the furniture a lighter color. This can be done by hand or with a tool. Do you like this entertainment center but wish to add other features or adjust dimensions? DutchCrafters is home to custom furniture and we always welcome custom requests. Get in touch today via email at Questions@DutchCrafters.com or Toll-Free at 866-272-6773 to ask us about them. We thank you for taking time to visit DutchCrafters.